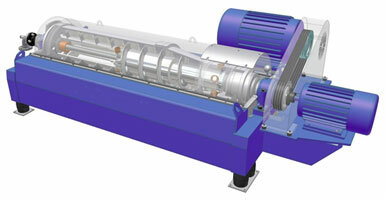 The Hiller DP model decanter centrifuge is a highly engineered piece of process equipment designed to separate insoluble suspended solids from a liquid. These machines are flexible enough to cope with a wide fluctuation in the feed material and still achieve excellent clarification and dewatering performance producing a relatively dry separated solids cake on many processing applications. The centrifuge consists of a solid bowl, which rotates and contains the process. A screw conveyor, contained within the bowl, turns at a slightly different speed from the bowl. The feed slurry is introduced into the feed chamber assembly by a stationary feed tube. It is accelerated up to speed in the feed chamber and discharged into the pond of the bowl through the feed ports. The liquid flows from the point where it is introduced to the pond to the liquid weirs at the large end of the rotating assembly. As the liquid flows through the pond, the g force causes the solids to settle out of the liquid and to sediment against the bowl wall. This causes a blanket of solids to build up against the bowl wall. The solids that build up against the bowl wall are pushed to the opposite end of the liquid discharge by the screw conveyor, which turns at a slightly different speed than the bow. The solids are pushed in the horizontal direction, up an incline and ultimately out of the liquid prior to being discharged from the bowl. Centrifugal force is constantly exerted on the solids in order to produce the desired solids in the discharged product. The g force, pond setting, differential speed, flow rate, and polymer addition influence the clarity of the liquid discharged from the centrifuge. The liquid clarity is also influenced by the hydraulic throughput rate: the higher the flow rate, the poorer the liquid clarity. The exact relationship will be dependent on the nature of the feed material. The differential speed will also affect the clarity of the liquid. The lower the differential, typically the less turbulence in the liquid, and the cleaner the liquid being discharged (centrate). However, once the sludge blanket is overloaded and the screw conveyor does not remove the solids at the same rate that they enter the unit, the centrate quality will deteriorate. The force that removes the solids from the liquid is the relative g force in the bowl. The faster the bowl turns, the greater the g force, and the greater the driving force to remove the solids from the liquid. The greater the g force, the better the centrate clarity will be. The solids are also affected by the same parameters as the liquid. As the g force is increased, the force to compact the solids in the sludge blanket increases and the solids become thicker. The increased g force will release more free liquid and produce a drier cake. The differential speed between the bowl and conveyor has a direct effect on the cake solids. As the differential speed between the conveyor and bowl is reduced, cake solids are increased. This increases the retention time and maximizes compaction in the solids. The solids loading rate also has an effect on cake solids. In general, as the solids loading increases, the percentage of solids in the cake decreases. This is not a direct relationship, but results from the requirement to operate the conveyor at a higher differential speed to remove the solids from the bowl. This reduces the time for sedimentation in the bowl, which in return lowers the cake solids. In addition to being used to improve liquid clarity, polymer also improves the dewatering characteristics of the sludge by agglomerating the solids and increasing the effective size of the solids. This is a variable that must be proven by field-testing. One last facet is the classification effect. As the liquid clarity deteriorates and the solids level in the centrate increases, more fines are discharged in the liquid. The cake solids level can improve due to the loss of fines in the centrate. This degree of this effect will be dependent on the particle size distribution in the feed material. Centrifuge Maintenance: Centrifuge maintenance is relatively low. It is perfectly normal to run a centrifuge twenty-four hours a day, seven days a week. If a short-term run is required the feed pump may be switched off and the machine left running. 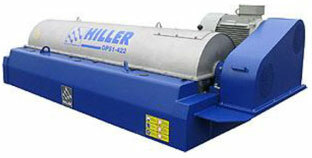 Hiller machines are extremely durable and reliable and require very few consumable spare parts on an annual basis. In most cases the greatest maintenance cost is created by abrasion to the surfaces in contact with metal. All susceptible surfaces are suitably protected with a variety of standard and optional abrasion protective surface materials or exchangeable wear components and liners for extended service life. As a convenience to our customers Hiller-US will offer customized annual service contracts with Hiller Service Technicians dispatched from both Germany and USA. Plus Hiller has established a net-work of factory approved regional independent repair shops as a supplemental alternative for long term machine life and serviceability. Hiller Separation & Process US based in the Austin, Texas area is the factory direct sales and support office servicing North and South America for Hiller Separation & Process GmbH of Vilsbisburg, Germany.